Not to be confused with Moon rock. Moonstone is a sodium potassium aluminium silicate, with the chemical formula (Na,K)AlSi3O8. Its name is derived from a visual effect, or sheen, caused by light diffraction within a microstructure consisting of a regular succession of feldspar layers. Moonstone has been used in jewelry for centuries, including ancient civilizations. The Romans admired moonstone, as they believed it was born from solidified rays of the moon. Both the Romans and Greeks associated Moonstone with their lunar deities. In more recent history, the moonstone became popular during the Art Nouveau period; French goldsmith René Lalique and many others created a large quantity of jewelry using this stone. The most common moonstone is of the mineral adularia, named for an early mining site near Mt. Adular in Switzerland, now the town of St. Gotthard. The plagioclase feldspar oligoclase also produces moonstone specimens. Moonstone is feldspar with a pearly and opalescent schiller. 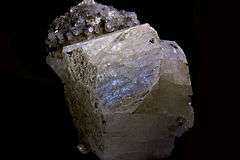 An alternative name is hecatolite. Deposits of moonstone occur in Armenia (mainly from Lake Sevan), Australia, the Austrian Alps, Mexico, Madagascar, Myanmar, Norway, Poland, India, Sri Lanka and the United States. The moonstone is currently the Florida State Gemstone; it was designated as such to commemorate the Moon landings, which took off from Kennedy Space Center. Despite it being the Florida State Gemstone, it does not naturally occur in the state. 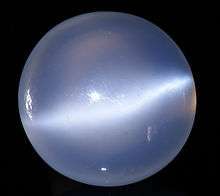 Wikimedia Commons has media related to Moonstone. ↑ "Moonstone" American Gem Trade Association. Retrieved 21 January 2011. ↑ "Moonstone" International Colored Gemstone Association. Retrieved 26 April 2012. ↑ "Moonstone" Encyclopædia Britannica, 2011. Web. 20 Jan. 2011. ↑ "Moonstone - Florida State Symbols". Florida Division of Historical Resource. Retrieved 1 Sep 2011.